WHICH NORTH STAR WHOLE HOUSE FILTER IS RIGHT FOR YOU? 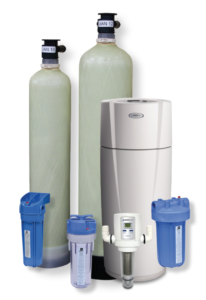 If your home has water problems which cannot be corrected with a water softener alone, North Star has a solution! The North Star line of specialty filtration systems treat your water’s special needs and rid it of sediment, iron, bad tastes and odors and low levels of pH. North Star’s whole house filters and central water system reduce sediment and rust particles throughout the entire home. Our whole home automatic sediment filter and central water system even clean their own filters, eliminating the need for replacement filters! By filtering sediment from all your water, other appliances like your water softener, water heater, washing machine and dishwasher will perform better and last longer! NORTH STAR HAS A SOLUTION TO YOUR PROBLEM WATER! PROBLEM WATER SHOULDN’T AFFECT YOUR LIFE. Whether your water comes from a private well or a municipal water supply, one thing is clear, the water in every home is unique. Older pipes, a water main break, and even the distance the water travels before it reaches your home can introduce additional contaminants into the water you consume. North Star offers an expanded line of state-of-the-art filters to deal with households with water contamination issues that may be easy to detect such as iron, chlorine, hydrogen sulfide and low-pH to arsenic, microbiologicals and pharmaceuticals which are undetectable. WHETHER YOU’VE NOTICED ONE INDICATION OR SEVERAL PROBLEMS WITH YOUR WATER, NORTH STAR WATER HAS THE SOLUTION! Scale reduction without softening provides another treatment option in demand by many consumers who want to protect their water heaters and plumbing. Eliminate iron, sulphur, chlorine and other problems with our automatic whole-house filters.